Bluetooth BT45-HON3 integrates your vehicle's OEM sound system with Bluetooth enabled devices so you can make hands-free phone calls and wirelessly stream audio media. Our plug & play technology allows you to maintain functionality of factory installed options such as HFL (Hands-Free Link), navigation, CD changer, Satellite radio, RSE (rear seat entertainment) system, and AUX/USB input. 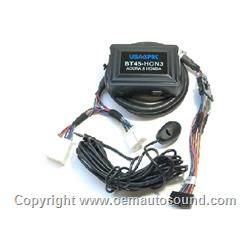 for Honda and Acura Radios, includes everything you need to install it in your vehicle. It allows your factory Acura Honda's radio to communicate with any Bluetooth enabled devices with A2DP audio streaming. You can stream audio from your favorite phone apps (including navigation), and you'll be able to handle phone calls using the Radio's controls or your steering wheel buttons. The Bluetooth interface also includes a 2.1-amp USB charging port as well as an auxiliary input for other non-Bluetooth audio devices. It supports Caller ID and text display so you'll see song and artist info on your Honda radio. With the latest in Bluetooth technology, the BT45-HON3 gives you great sound and works seamlessly with the vehicle's existing audio sources. You can carry on a noise-free conversation in almost any environment, and USA Spec's technology gives you the best possible sound quality. The built-in auto-mute function makes sure you never miss a call. Change tracks from the radio or the steering wheel Stream music, podcasts, GPS directions from apps such as iHeart Radio, Spotify, Google Map, Waze, and YouTube. *Android, Apple, Blackberry, & Windows compatible. *Plug & Play installation and seamless integration with Oem entertainment Systems. *Automatically mutes radio with easy one button operation to answer/end or reject phone calls. *Incoming called number announcement & display on supported radio. *full & rich audio quality for media steaming with music info display on supported radio.